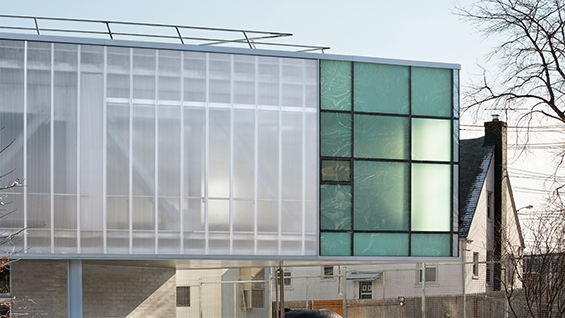 Smith-Miller + Hawkinson Architects, Zerega EMS Station, Bronx, NY. Photo: Michael Moran. Laurie Hawkinson is a co-founder of Smith-Miller + Hawkinson Architects (SMH+) and a Professor at Columbia University’s Graduate School of Architecture Planning and Preservation. At SMH+ she led the design for the Corning Museum of Glass, North Carolina Museum of Art Amphitheater and Master Plan, the Wall Street Ferry Terminal, the Land Port of Entry at Massena NY for the GSA, a new Branch Library at Roosevelt Island for NYPL and recently completed the Zerega Avenue Emergency Medical Services Station for the City of New York. She holds an undergraduate and master’s degrees in fine arts from Berkeley, and received her professional degree in Architecture from the Cooper Union. She is a member of The Contemporary Arts Council at The Museum of Modern Art and a founding member of the Board of Directors at The Wooster Group. She currently serves on the Public Design Commission for New York City. Lecture will take place in room 315F and lunch will follow in the School of Architecture lobby. This event is open only to current Cooper Union Students, faculty and staff.